(7-CD + DVD + 316 page hardcover book) The fall of Madrid in March 1939 and Franco’s subsequent dictatorship marked the bloody conclusion of almost three years of civil war in Spain. To this day, general interest in those historical events has not waned, and it extends far beyond academic circles. Many outstanding works of art from that period retain their full impact as each generation discovers them anew. 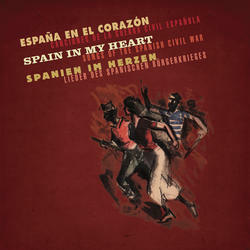 Bear Family has now completed the boxed set entitled ‘Spain In My Heart.’ For the first time in such quantity, this edition features more than 120 Spanish Civil War songs on 7 CDs: songs of the Spanish people and the Republican Army (many hitherto widely unknown outside of Spain) along with songs created and sung by members of the International Brigades. A significant trait is the inclusion of historic shellac recordings with Ernst Busch, Pete Seeger, Woody Guthrie and Paul Robeson. In three languages, the 300-page booklet features all lyrics with comments and explanations, a timeline of the Spanish Civil War, extensive excerpts from eyewitness accounts by authors ranging from Ernest Hemingway to Ludwig Renn, more than 40 color reproductions of Republican posters, a great number of historical photos and a collection of 31 outstanding watercolors from 1938 in facsimile. A bonus DVD features the Israeli documentary film ‘300 Jews Against Franco,’ which reveals the widely unknown story of Palestinian Jews who fought as volunteers in the International Brigades during the Spanish Civil War.